A plethora of world famous beaches and the large range of activities they enable, the claim that it might be one of the oldest places on Earth ever inhabited by humans, as well as the modern luxury and comfort standards observed, all these give Nice the rightful statute of jewel of the French Riviera. Dubbed the Beautiful Nice, the city features whatever it takes to be a tourist paradise. Indeed, next to Paris, Nice is the second most popular tourist destination in the entire France. Its efficient infrastructure, its cosmopolitan atmosphere, the beaches, the sand and the sun, as well as the Mediterranean mild climate blend into a formula that represents the visiting card of the city. The place has allegedly been inhabited since about 400,000 BC, a hypothesis substantiated by the Terra Amata archeological site. The Greeks were the ones who founded the city proper around 350 BC, in the honor of Nike, the goddess of victory. The Italians and the French were the main forces which disputed their dominion over the city during the Middle Ages; eventually, Nice became a part of France in 1860, but the Italians made further attempts to bring the city back under the Italian administration. World War Two occasioned Nice to affirm itself, once again, as a safe haven for Jews. Subsequently to the end of the war, the city underwent an economic boom due to its becoming the major tourist destination everyone has heard about at present. The Beachfront hotels in Nice tend to be the most expensive of all, but tourists should also be aware of the fact prices rise in summer – the busiest season of all, when the tourist request rises significantly – or in February, when the city hosts the notable Carnival of Nice. On the other hand, Nice also makes available a great number of establishments offering less expensive accommodation services, such as low rated hotels, hostels or even camping sites. Nice is far from lacking eateries, and, in fact, with respect to the eating venues, Nice is replete with restaurants, bistros or other establishments of this kind. Bakeries, patisseries or fast food stalls are an inspired choice if in need of a quick snack. Besides international cuisine, which is so well represented in Nice, tourists must try certain local products, of which the Nice salad (or salade nicoise) seasoned with tuna, or the socca (chickpea flour pancake), the fish soup, or tarts aux blettes, the ratatouille and tuna sandwiches are definitely worth mentioning. 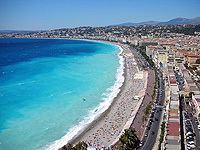 The beaches in Nice fall in the category of must-visit objectives which need no further presentation. However, the city is home to a series of religious edifices, such as the Russian Orthodox Cathedral of Saint Nicolas, the Cathedral of Our Lady of Cimiez, the Basilica of Notre Dame de Nice. Other landmarks are represented by the Lascaris Palace, the Acropolis, the Promenade of the English (Promenade des Anglais), the Arc de Venet, or by a series of museums and art galleries, such as the Matisse Museum, the Museum of Asian Art and the Museum of Archeology. Parc du Chateau or the Eden Garden, along with the plethora of golf courses contribute to the tourist magnetism of the place. The Carnival of Nice (or the Mardi Gras Carnival) is the one event which gathers together a large flow of tourists every year in February. However, the Poets Spring, the Museums Spring, the Sacred Music Festival, as well as the Nice Jazz Festival or the Manca Festival evidence the appreciation Nice proves to the cultural and artistic scene, whereas the Nice Half Marathon, Nice en Roller, the Fight Challenge of Henry Deglane (international wrestling competition) or the International Rowing Regatta count as the main sports events held in the city.